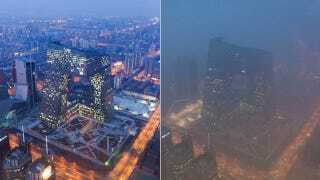 Beijing is choking - as these two pictures vividly demonstrate. On the right is the city's skyline on Monday; on the left the same view on 4 February 2012. The suffocating smog is not just bad for health, it may also have a more potent effect on climate change than previously thought. Dense smog shrouded Beijing over the weekend, causing levels of airborne soot, also known as black carbon, to go off the charts. Some reports put levels of one type of tiny airborne soot particle at well over 30 times the World Health Organization's recommended limit in parts of the city, and hospital admissions were up. But as well as hurting health, soot has an effect on climate change - and a new study suggests this is more potent than we thought. Tami Bond of the University of Illinois at Urbana-Champaign and colleagues report that its warming effect is almost twice the Intergovernmental Panel on Climate Change's estimates, which would make soot the second biggest warmer after carbon dioxide (Journal of Geophysical Research: Atmospheres, DOI: 10.1002/jgrd.50171). The good news is that unlike CO2, soot stays in the air for only a few days. So action to curb soot from coal fires, diesel exhausts and cooking stoves could be a quick antidote, says Bond. Such a measure would save lives, too. Soot is estimated to kill 2 million people a year, mostly through indoor pollution from cooking stoves.